Time to share some sewing. It has been a slow start back into the garment game but I've started off with a bang. 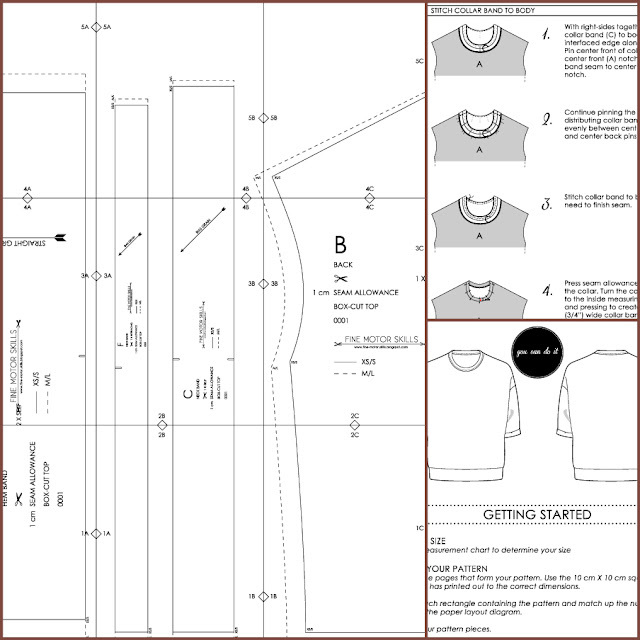 This post includes the pattern, hooray! And audio/visual content, whoa! This is the Odette top. She was born because I have been struggling with wearing woven tops. All I ever want to do is wear knits. My current woven tops aren't comfortable enough for me to want to take them off the hanger. They either feel too restricting or are cropped to wear with high-waisted things. Let's not even go there, talk about discomfort. Why in the world do I have so many high-waisted things? If I'm going to wear a woven its going to need to be roomy. All of my trendy button-ups are too tight, especially across my giant swimming shoulders. I am convinced I got my giant swimming shoulders from my early swimming years, however I am pretty sure they are from my stocky father. If all I wanted to wear was knits I thought I would start with an inspiration from knits. 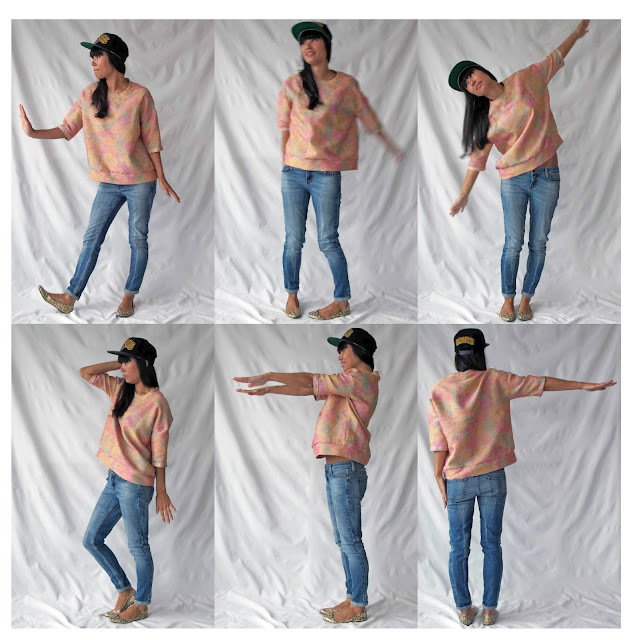 Odette is sweatshirt-inspired and hits on the rather ubiquitous structured tee trend. 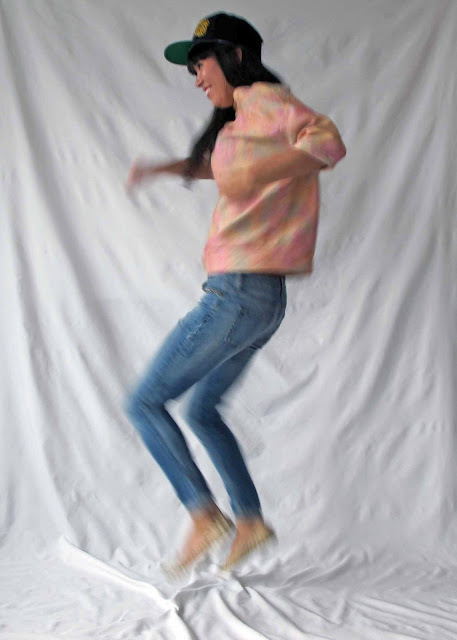 I like simple garments but with a certain extremity to them either in shape, print or texture. The structure of this top is interesting but it's still simple. This simplicity allows for crazy fabric. I LOVE CRAZY FABRIC! I've been especially in love with the double woven quilted fabrics, tapestries and matelasse's on the runways this spring. 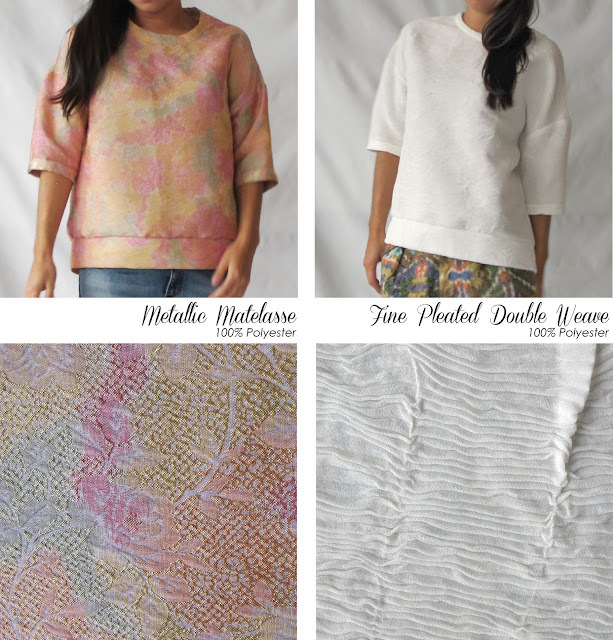 Hmm, I wish I could link those fabric terms up to designer's garments but I'm a lazy blogger. I made this top in two different fabrics. A gorgeous metallic matelasse and a finely pleated double-weave. I actually used the wrong side of the metallic matelasse because the right side had an additional metallic rose pattern and it was way too busy. This fabric looked like it had been in the store since 1994 and that's why I had to have it. The finely pleated fabric was a good find too. I was worried it would create too much structure in the top but it turned out perfectly. I love this version, it feels a little more sophisticated. You may be able to find a similar fabric in your local store. It looked like current stock at the Fabricana where I purchased it, they carried about 5 different colours too, I may have to go back for more. When I started this blog I knew I wanted to share some patterns. This may be one way I can gain some readership and frankly, amongst other bloggers, this is one area I have a leg up. I know pattern drafting and construction techniques. I have a library of design ideas filed away in my brain, all ready to go, and I know what I like. Because this knowledge is second nature it allows creativity to flow through to the design of the garment. I need to exploit this strength because in the realm of pastry design I fall seriously short. Thus far I have been copying and emulating others in the pastry world which feels cruddy. I know it's because I lack the techniques and experience but it is frustrating! However this is what makes pastry so intriguing right now. I have a whole new world of design to discover and hone my taste within. Ah, baking, okay back to sewing. I haven't used a commercial pattern in years and couldn't remember what the darn things looked like or what kind of info a home sewer would require. So after a bit of online research I discovered the downloadable pattern phenomenon along with a fantastic community of sewers. Burda was where I found this burgeoning society first but then ran across inspiring independent pattern-makers like Victory and Grainline. Mind blown. Creating this pattern took forever! It was the formatting and layout that took the longest. I am a sucker for over-analyzing graphic design. Fonts were changed, logo's placed then updated, patterns re-named and due to these changes I had to re-save the PDF's a bajillion times over. On top of that I'm using an ancient software program, Illustrator CS released in 2003, on my 7 year old laptop. My computers new name is officially Crashy McCrash Crash. > the voluminous structure of this top is not for everyone but I love a volume on top and skinny on bottom silhouette. My next patterns will be easier to wear, promise! > I work in metric. Most commercial patterns are in imperial and to be honest I kind of use both at different times for different things but all my drafting tools are in good old centimetres. UPDATE 4/21/13: If the pattern download link didn't work before it should work for you now. 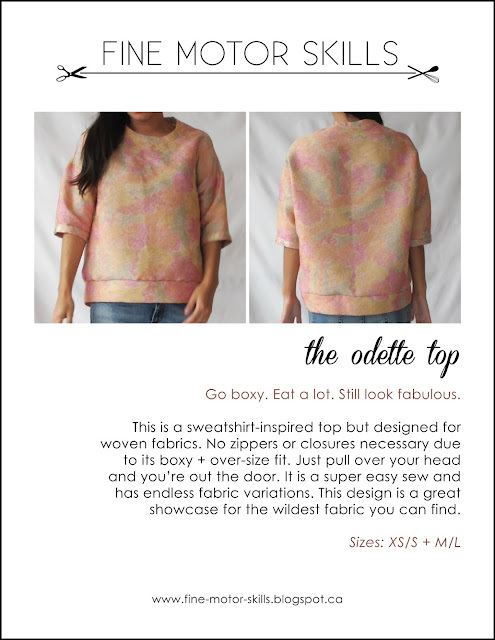 Please download your Odette Pattern here! Or visit my BurdaStyle profile here. Where I will be uploading patterns. If anyone makes Odette, has questions, advice or constructive criticism I'd love to hear from you! And finally please excuse my blurry photoshoot I have a point + shoot camera and my tripod is a stack of books. 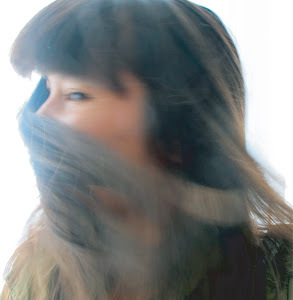 When we did photoshoots back at my old job we would often get the models to dance. It loosened up the shoot and I usually loved the end results. So I thought I would try it on my self-conscious self. Here is a musical compilation that took way too long to make but now I finally know how to set pics to music. I enjoy punching when I dance. Thanks for sharing your pattern, it's great! Just what I have been looking for. You're very welcome. Glad you like it! What an awesome pattern, you are so talented! I think with different fabric it could be made to look so different, something that I am always looking for. Thankyou so much for this pattern! It looks adorable Emma! Thanks so much for sending the link. It's super rewarding to see someone enjoy a pattern. 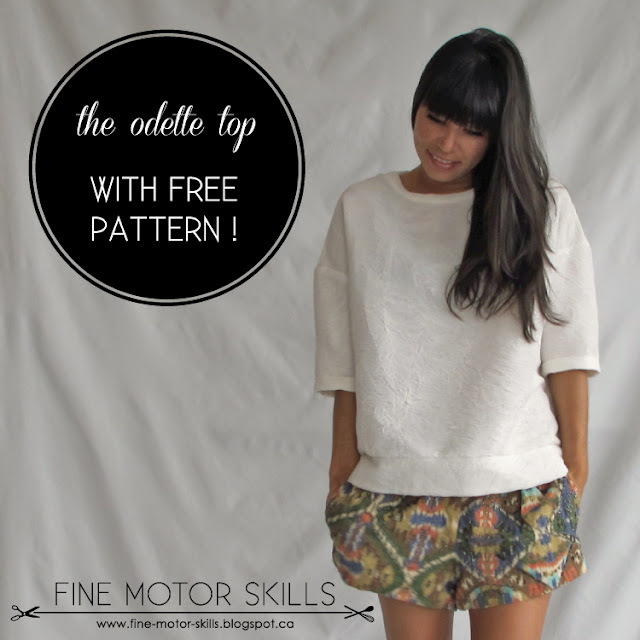 Great fabric and styling, it makes me want to sew more Odettes! This is perfect. Thank you so much. Your tops look great! Divine top. Well done. And thanks the free pattern. Just finished an Odette, and what shall I say: it fits perfectly around my 8 month-pregnant belly! Thanks for this free pattern, great work and so much easier to work with than some so called professional patterns!